A family picnic is a great way to reconnect with your kids and spend some quality family time together. Here are some tips on how to plan, prepare and execute the perfect family picnic together or with a larger group of friends and family combined. Before you start preparing for your picnic, you’ll need to ask yourself these important questions. How many people will be at your picnic? What are the ages of the attendees? Where is the best picnic spot for your family? Is the picnic spot available? Does the picnic spot allow glass containers? How is the access to the picnic spot? Can you roll a bag or stroller there? Include all necessary paper products for your picnic. Make sure you include necessary utensils and plenty of napkins! Be sure to check with the picnic location to see if they allow glass containers before you show up with your glass jar of baby food or fizzy soda. Prepare enough snacks, and pack more than enough food for the day. Being out in the sun, running around and/or engaging in activities can increase an appetite — especially for kids. If there aren’t any picnic tables at your location, make sure you pack enough chairs and/or blankets for the entire family. It’s also a good idea to bring an umbrella or an outdoor tent for shade — especially if you have a baby. Pack a small bag with any items you may need while on your family outing. Band-Aids, bug repellent, sunscreen, wet wipes, hand sanitizer, extra napkins, jackets and an extra blanket all ensure your time together will be comfortable and safe. Plan a scavenger hunt, search for animals in the clouds, bring a board game or a jar full of blank scraps of paper and a pencil. The jar is a great way to engage your family and spark conversations: Have each person write down a question, mix them in a jar and pass it around while each person pulls one question at a time. 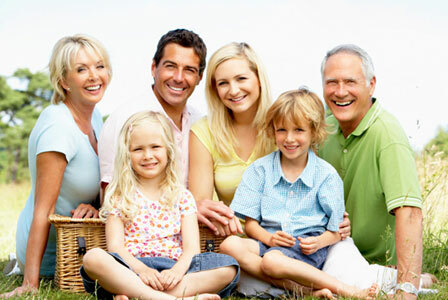 A family picnic is a great time to reunite your closest friends and relatives. Think of it as a mini family reunion. There doesn’t have to be a special occasion or event to get your loved ones together. If you decide to open up your family picnic to more people, plan accordingly and consider adding these tips to your list. Potluck style: Require everyone to bring a favorite dish like an appetizer, heavy hors d’oeuvres or a pot of chili — for a chili cook-off. Picnic style: Have everyone bring his or her own food and drink. Organized picnic: Send an Evite and have everyone either sign up to bring a specific dish or assign dishes to the attendees. Festive picnic: To celebrate a special day or event, pick a theme for all the food, drink, games and decorations.